Ms. Kaur, an author and activist, is a third-generation Sikh from California. She named her son Kavi, which means poet, because two of his great-grandfathers were poets. She said she planned to choose a similarly meaningful name for her unborn daughter. So Ms. Kaur was furious when she saw on Twitterthis week that the long-running syndicated advice column Dear Abby had encouraged readers to avoid giving their children “unusual” names. The heated reaction to the column — which has been a staple in American households for decades and was started by Ms. Phillips’s mother, who used the pen name Abigail Van Buren — has inspired a fresh debate about identity, acceptance and inclusion. “Abby’s column was deeply infuriating and also revelatory,” Ms. Kaur said. 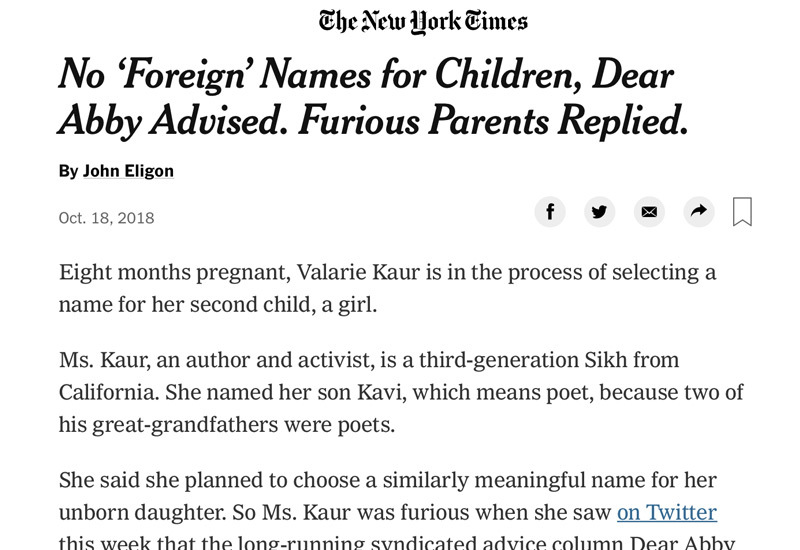 “Abby is clinging to an old America, where white is considered the norm and everything else deviant and inferior.” Ms. Kaur added that she and her partner believed it was more important for a child’s name to connect them to their heritage than for it to be easy to pronounce. Ms. Phillips did not respond to a request for comment. For some readers, Ms. Phillips’s advice was simply practical. “She’s right. Get over it,” Ike J. Awgu, a lawyer from Ottawa, wrote on Twitter. Mr. Awgu, whose father is from the former Biafra and whose mother is from Antigua, said that while his given first name was Ikechukwu, certainly not the easiest name to pronounce, his middle name is Jonathan. He goes by “Ike,” he said, because it is easier for Canadians to understand. Yet he snickered at the suggestion that he was in any way abandoning his culture by using a simplified version of his real name. “Is my five-letter, perfectly phonetic name too difficult for you,” Ms. Balkar recalled thinking. “The reality is that a lot of this has to do not with names but with whiteness,” Mr. Giridharadas, 37, said. “There are a lot of complicated names from Polish and Russian and Italian and German backgrounds that have become second nature to Americans.” The “unusual” names referred to in the Dear Abby column aren’t unique in their complexity, he said. They just tend to come from places where people aren’t white. And they tend to have real-world consequences. An abundant amount of research has shown that job applicants who submit résumés with white-sounding names were more likely to get responses than those with black-sounding names. This discrimination has caused Aaron Rahsaan Thomas to lean into his full name. A television writer and producer, Mr. Thomas said he once wrote a script for a major Hollywood director and got positive feedback on it. The director’s only criticism was to ask Mr. Thomas to remove his middle name from the title page because it was an easy tell that Mr. Thomas was black and that might influence someone’s opinion of the script. Mr. Thomas kept his full name on the title page. Mr. Thomas wants people to know he is black, especially other aspiring black writers. He also wants to honor the reason his father, a theologian, named him the way he did — giving him a Jewish first name, a Muslim middle name and a Christian last name. Follow John Eligon on Twitter @jeligon.